After Barley chased his brothers out of BloodClan, the Clan separated. Until Fang came to the twolegplace. He gathered up a few cats to restart the dangerous Clan. Now, BloodClan is as dangerous than ever. A calico tom walks up to you, his black collar studded with dog and cat teeth. His clawsm which are now dog claws, clink quietly on the alleyway ground as he approaches you. "What are you doing here? Scram before I rip out your throat!" he hisses, and you immediately know he is Fang. You tell him you want to join his Clan. "I'll show you around. 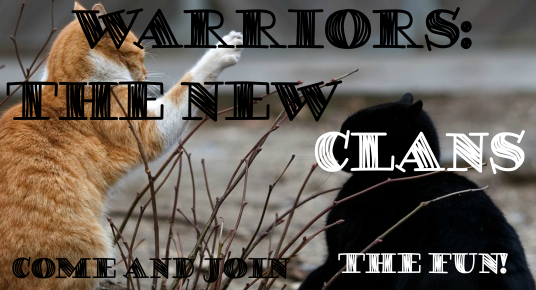 But later you'll have to win a fight with that cat over there to actually have a chance to join Bloodclan." Fang turns around silently and you pad after the BloodClan leader. "Here all all the cats of BloodClan. They have slight value - unlike you. Now come if you even want a chance to join," Fang says in his growl-like voice. His calico tail turns the corner and you follow after a quick hearing of the list. "Now prove you're not a stupid kittypet." 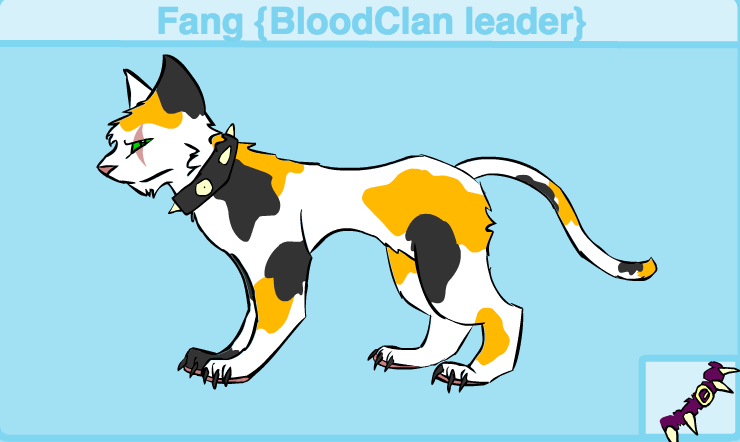 Fang glares at you, uncertain whether to let you join BloodClan. The calico tom, Fang, rolls his eyes. "So you insist you need more information? Any more after this and I'll claw your good-for-nothing eyes out!" he hisses, before beginning to list extra trivia about new BloodClan. Enforcers: Enforcers are cats that enforce the BloodClan rules. They do not often travel with Fang, like some guards do. They have the right to kill all cats, unlike warriors who can only kill non-BloodClanners. Claws/teeth: All BloodClan members should have a collar of any color. The collars are often studded with dog and/or cat teeth and/or claws, giving the cat a meaner look. Dog claws can be worn by higher ranking cats on their claws. Collar: Black with dog and cat teeth. He also has dog claws on his claws, making them unretractable.